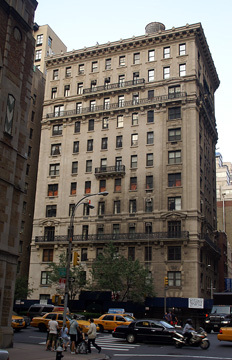 This impressive 12-story apartment house was designed by William A. Boring and completed in 1911 two years after he had designed 540 Park Avenue on the northwest corner at 61st Street, which has been described, according to James Trager, the author of "Park Avenue, Street of Dreams" (Atheneum, 1990), as "the first of the high-class apartments to be built on Park Avenue." 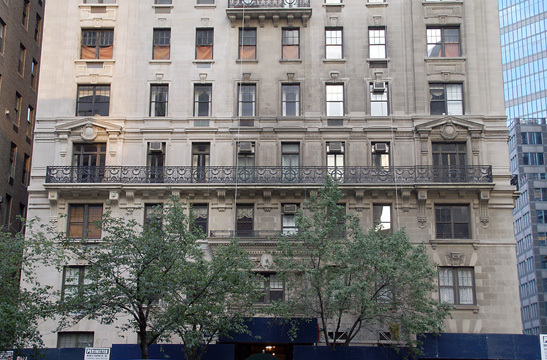 Boring also was the architect for an apartment building at 520 Park Avenue, but it was demolished in 1932 and replaced by Christ Church. Boring would become the head of the School of Architecture at Columbia University. This building, which has a doorman but no garage, has 27 apartments and was converted to a condominium in 1987. It has a canopied, three-step-up entrance and no sidewalk landscaping. Its few but bold and very attractive balconies contrast admirably with the building's finely detailed limestone facade, all well contained under a large cornice, a strong composition. The location is wonderful, very close to midtown and many of the city's best boutiques and restaurants and excellent transportation.